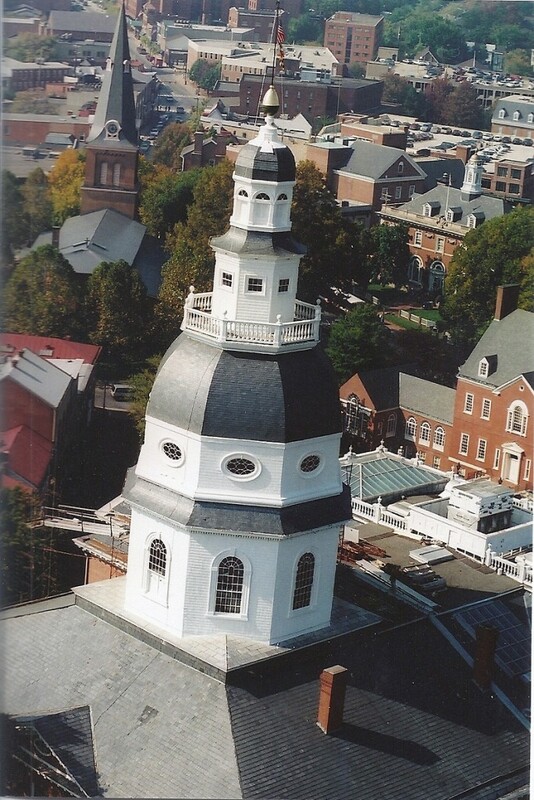 State House dome in 1995 from a helicopter by Tom Darden. At an Annapolis meeting Monday, the commission took no formal vote on a final recommendation, but seemed to reach a consensus on raising the total amount an individual may contribute to state election campaigns from the current $10,000 to $25,000 during a four-year election cycle. The number was proposed by Del. Jon Cardin, a commission member who chairs the election law subcommittee of the House Ways & Means Committee. The commission also reached consensus on raising the current limit to any single candidate from $4,000 to at least $5,000 or even $7,000 in any four-year election cycle. Indexing the limits to inflation was also discussed. Commission member Marty Madden, former Republican leader in the state Senate, said any increase in the limits made little difference unless the commission proposed limiting the contributions from limited liability corporations (LLCs). Every LLC, which real estate developers often create for each project or parcel, are treated as individuals. “We have to look at disclosure at who is behind the LLCs,” Madden said. Currently, these corporations must only list a resident agent, who is often unrelated to the controlling interest behind the LLC. Attorney Bruce Marcus, the commission chairman, said there is really little distinction in Maryland law between other corporations and LLCs. “There is no reason why they should be treated differently,” Marcus said. The commission on Monday also discussed banning political contributions from companies doing business with the state, but will take that up again in July. Also on the agenda for July and another meeting in August are dozens of items that include public financing of campaigns, controls on independent expenditures in support of candidates and new enforcement procedures for violations of campaign laws. ← Joe Walsh has been sober now for 16 years. So What?